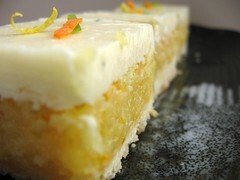 Slammin’ Citrus Squares with White Chocolate-Lemon Thyme Icing - Do You Know The Muffin Man? Notes: The shortbread crust is a no-brainer, although it is a bit dry. The citrus layer calls for a full quarter cup of orange zest; I should have used the full amount. The 3/4 cup of lemon juice is no match for all the sugar, and I found the filling to be too sweet. It uses flour as a thickener so it bakes up kind of pasty. The icing is a little salty (from the cream cheese? ; a bit more sugar and white chocolate would be better. They're tasty, but I don't think they're worth the effort.